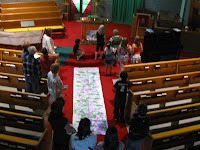 St. Catherine's Anglican Church, Port Coquitlam: It's Messy Church Time Again! It's Messy Church Time Again! St. Catherine’s Anglican Church will hold another session of Messy Church on Saturday, October 24 from 3:30 – 6:00 PM. Messy Church is a monthly program for families who find they can’t manage a Sunday morning service but would like their children to have a Christian element in their lives. The program features family fun, food, fellowship and worship. Fall sessions focus on the sayings of Jesus. The September Messy Church session began at 3:30 with people registering, having a drink and cookies and playing board games. From 4:00 to 5:00 they worked on a variety of crafts, including friendship bracelets, potato prints and a Grape Treading banner. At 5:00 everyone marched into the church for a talk about remaining close to Jesus and how much Jesus loves us. 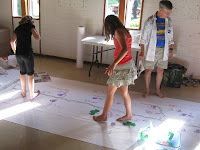 Participants wrote prayers on grape-shaped post-its and then marched back into the hall for dinner.